Cracow International School follows Cambridge Primary programme, addressed to children between the age of 5 and 11. Cambridge Primary offers international education developing students’ overall skills, as well as enhancing their knowledge in the fields of English, Maths and Science. These subjects are taught fully in English. Cambridge Primary is fit to be implemented in bilingual and English-only schools. It is also compatibile with national curriculums of the countries in which it is implemented. In addition to high-standard subject programmes, Cambridge International offers Cambridge Global Perspectives programme, which enables students to develop intercultural competency, and teaches the inquiry-based approach to different issues through project-based classes. Cracow International School is going to cover this programme within separate lesson units in order to allow students to implement the knowledge they gained during educational classes, as well as to help them independently search for answers to their own research questions. Starting from kindergarten groups through the school ones, Cracow International School implements Cambridge primary, o9fferring international education from the early years. Cambridge programmes are dedicated for students aged between 5 and 19 and implemented by the best international schools all over the world. Cambridge Primary, Cambridge Lower Secondary, Cambridge Upper Secondary i Cambridge Advanced allow for smooth transition between educational levels. In the future, as soon as students reach the required age, Cracow International School is going to implement Cambridge Lower Secondary Programme, too. Wide range of subjects and adaptability to national curricula allow students to gain knowledge within the highest standards. Up-to-date teaching methods and networking with schools from dozens of countries create a unique opportunity to learn in an international environment, in a fascinating and welcoming community. access to materials created by Cambridge and contact with international schools around the globe. Cambridge qualifications are widely recognized all over the world, and appreciated by high schools, universities and employers. Students can be sure that no matter If they decide to stay in their home country or to take up education in any place in the world, they will have solid and recognizable education that is going to make a strong asset on the job market. Cambridge International puts emphasis on combining subject knowledge with logical thinking skills and understanding concepts. It allows for systematic monitoring of students’ progress and makes it a priority to support them in the process of gaining knowledge in bilingual and English-only environment. 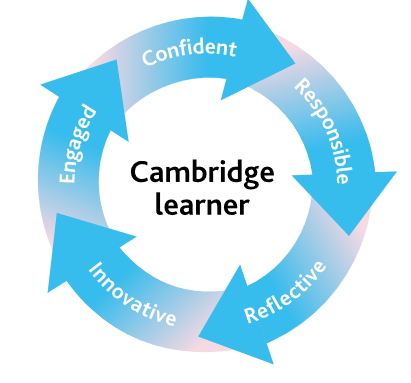 Cambridge learner profile promotes the development of such features as: engaged, confident, responsible, reflective, and innovative. It is worth mentioning that the organization expects these features to be developed not only by students, but by teachers, too, which encourages the whole school community to self-develop and supports its members in the process. Primary Checkpoint Tests summarize Cambridge Primary. There are separate tests for English, Maths and Science. It is important that English can be tested in two ways – as a native language or as a second language. Cambridge Primary Checkpoint allow students to recognize their strong and weak points. The tests are assessed by external examiners from Cambridge, along with internationally unified benchmarks. Students can approach the tests in May or in October. The content checked by Cambridge Primary Checkpoint goes along with Cambridge Primary curriculum for English, Maths and Science. Each student receives a detailed report including obtained score for the whole subject, as well as for separate units. There is also feedback on which questions the student dealt with in the best and the weakest way. Cambridge Primary Progression Tests are tests that are written every year. They include English, Maths and Science. They are addressed to Stage 3, 4, 5, and 6 of Cambridge Primary students. They are assessed by the teachers from the child’s school, along with internationally unified benchmarks. They can be held at any moment of the school year. They allow the school to monitor students’ progress as well as to compare the results of individuals and groups with other students, groups, schools, etc.